We have a programme! 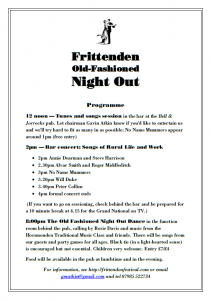 Click on the image to preview the programme for Saturday. A great sing and some tunes at lunch time, a smashing concert in the afternoon, and a delightful dance in the evening… Why not join us? The bar events are free (and will be fabulous) but tickets for the dance are £7 and £4 (concs), with all funds raised going to help fund further events. Contact gmatkin@gmail.com or 07985 522734 for information. 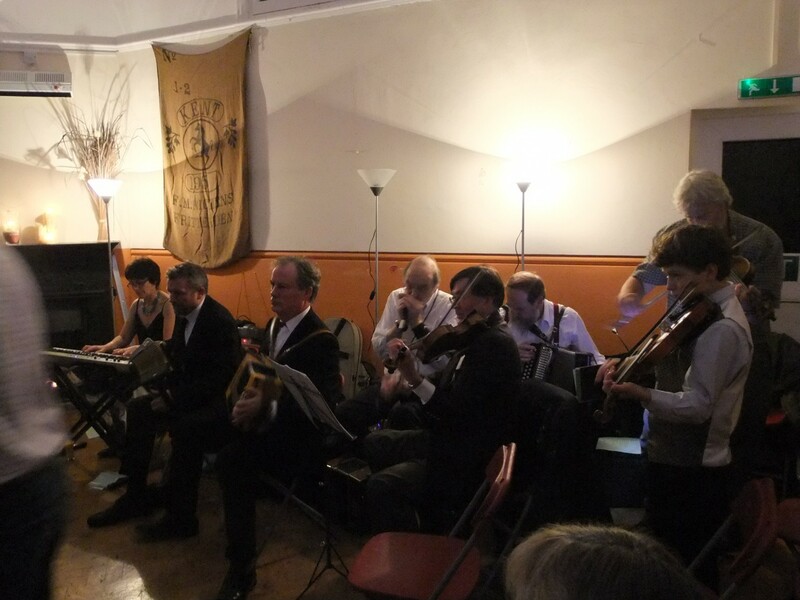 These photographs of the Horsmonden Traditional Music Class were taken by singer Annie Dearman on Saturday night (24th November). 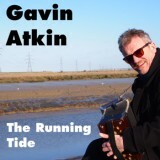 I’ve long felt that compared with some other areas – such as Northumberland, Gloucestershire and Sussex – Mid and West Kent has not had as many strong players of traditional tunes. That’s not to say there weren’t any good players – just that if there were more of us to play in sessions we would all have that much more fun! So a couple of years ago my wife Julie Atkin and I agreed that I should start a free regular twice a month class in a quiet room at the Gun and Spitroast pub, Horsmonden. The aim of the classes would be to help new players work up a good collection of tunes, build their confidence and get some experience of playing in sessions and for dancing. 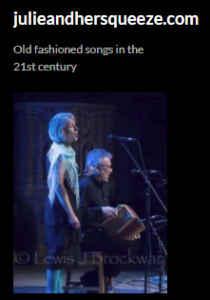 I should explain that I’ve been playing regularly for dancing since the mid-1970s, and play many of the instruments most often used in traditional music, including fiddle, melodeon, mandolin, concertina and guitar. With that background, we thought, I should be able to can help deal with problems in playing, and can advise on how to find ways of giving tunes lift and making them danceable. We meet on the second and fourth Wednesdays of the month from September through to the spring, and at each class we work on three tunes, two of which we learn from written music and abc notation, and one of which we learn by ear. The class includes a wide age range, and a wide range of abilities, and one or two experienced players also like to drop by to learn a few new tunes. To give new players experience of sessioning and playing for dancing, we’ve also started a regular tunes-only session in the bar at the Gun & Spitroast on the first Sunday of the month, where the class tunes feature heavily. Also, twice a year we organise a dance at the Bell & Jorrocks at Frittenden, at which the class get a chance to play for dancing, and at a proper dancing speed. These events have proved to be enormous fun for everyone including the class, and we’re very grateful that our friends Rosie Davis and Chris Rose have been kind enough to call for them on different occasions. How has it all worked out? As the geezer who has been leading this class I have to say it’s been challenging for me (it turns out that running classes requires far more preparation than I had anticipated! ), but it’s also been great fun and very sociable. I can’t pretend the numbers have been large – the biggest attendance we’ve had in an individual class was ten, the smallest was just one. However, many of the people who have been coming along assure me they’ve had a great time and learned a lot about playing, and I think we’ve had some real successes. One example of this is my wife Julie – through the classes she has worked hard to become a really effective pianist for this kind of music (as the video shows!). Our youngest player – still just 13 – keeps picking up new instruments and is coming on by leaps and bounds on all of them. The new gallery photos come from the Harvest Hop dance we held a couple of nights ago, with the wonderful Rosie Davis calling and introducing turns from Annie Dearman and Steve Harrison, and Julie and myself. 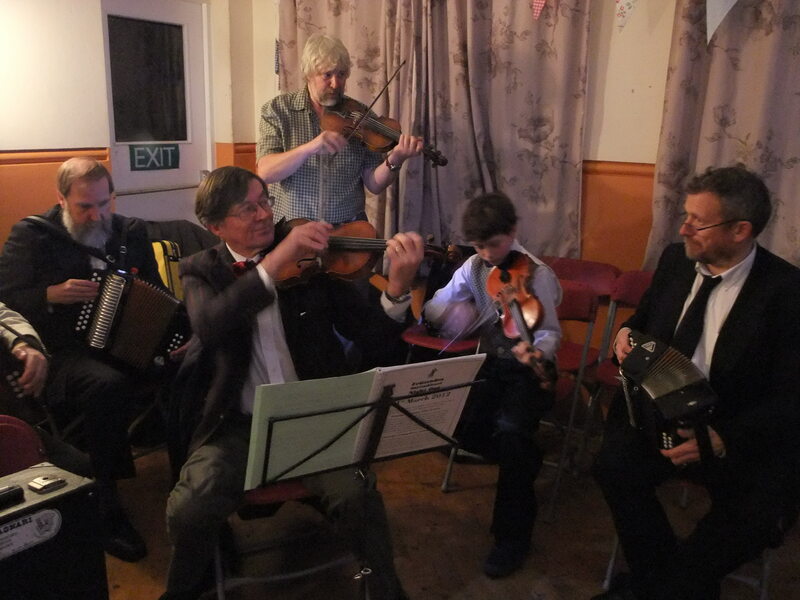 Some of you will notice Steve playing mouthorgan in the band, and also Tim Bull, a Frittenden villager who is well known for playing melodeon with the English ceilidh band Florida. 28th April 8pm - free Castle Inn session, Brenchley with guest Nigel Hobbins. Join our workshops, play for a dance in March! What is English traditional music? Leading box player, singer and dancer John Kirkpatrick explains here.